Kelly (the bright light I'm talking about) was able to let go of her fears and be herself in front of the camera. 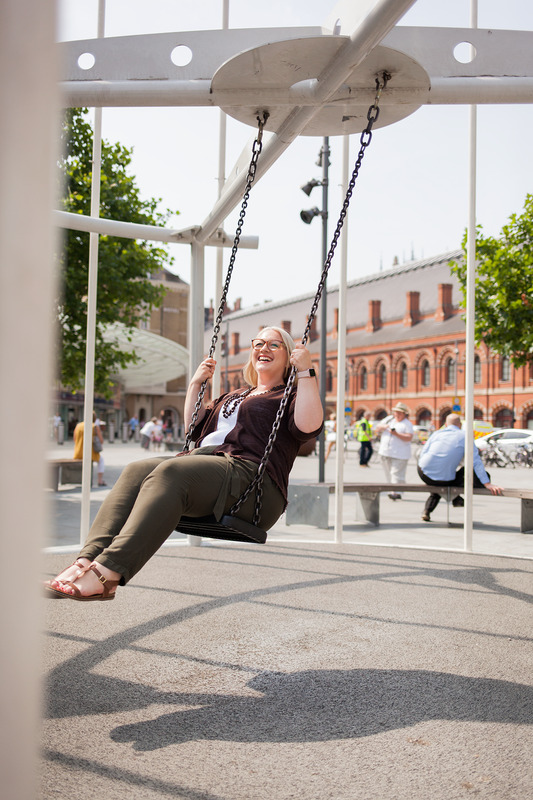 That magic resulted is an amazing session full of laughter, big smiles and even an art installation swing! Kelly has owned and operated Chrysalis Consulting in the UK since 2013 and is launching a new business this fall "Soulful Leaders, the no-ego zone for heart centred leadership". I am so excited to watch this new business grow as I know it will be a huge success based on working with Kelly. Kelly and I had a great time together because she was able put aside any fears about getting in front of a camera. Trust me, I've been there too. I know how challenging it can be, but when I'm given space to be me - the goofy, laughing, face making gal - magic happens. nervous, be frustrated and then get the hell over it! Once you get past that invisible hurdle, it's a super fun ride to the end.